WhatsApp landed a hit, appearing at the right time. Alternatives followed, like Threema and Telegram. In this post I will briefly talk about the first two, and then point out the additional benefits of using Telegram. Hold your breath for the recent features introduced in Telegram! WhatsApp gained a *lot* of popularity, and alternatives only just came up, several security vulnerabilities have been published. For the longest time, WhatsApp has transmitted data unencrypted in plain text, making it unreasonably easy to eavesdrop. There have also been vulnerabilities allowing session and account highjacking, and pulling unwanted data. It took years for end-to-end encryption between android to android devices; yet, iphone clients still do not send messages securely. If you want to read more on the security and privacy issues and history of WhatsApp, the wikipedia article has the information and links to references. With these blatant holes and issues, even resulting in some governments recommending against the usage of WhatsApp at all, itâ€™s obvious secure alternatives would be really important alternatives for informed users. Sadly, just like Facebook, WhatsApp had already made their huge user base, establishing themselves, making it harder to move the platform with the contacts you want to keep in touch with. Threema was one secure alternative, introducing the user to end-to-end encryption and private+public keys. In the more recent past, Telegram became a superb alternative as well. Its an open source, community project, and as such provided a high demand on security, features, device compatibility, and freeness (as in freedom). For me, one of the most important things is device compatibility. WhatsApp I can only use on my mobile phone, Threema I can only use on my tablet. Sadly, they are not compatible with the other. Telegram however works on both, as well as Webbrowser and desktop apps. Itâ€™s also available for all mobile platforms; Android, iPhone/iPad, and Windows Phone. After it had already become my favourite of the messengers, in the recent months additional features were introduced that lift Telegram from being the most solid and compatible, to also raising it to the next level. The first addition was so called stickers. 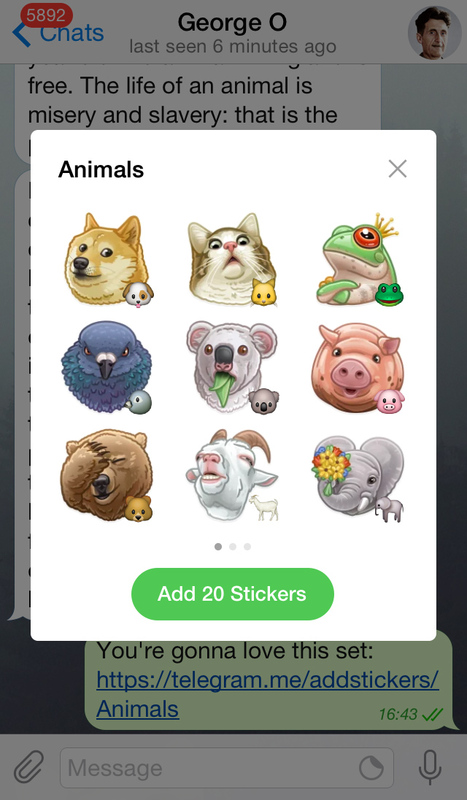 High quality images in the style of emoticons, of which you could create your own stickers and sticker sets. They even provided the option to submit your own, with the option of getting money for them. The thing that made these stickers way better because discoverable was the recent addition of Bots. Anyone can create their own bots that react to commands and can provide their own action buttons. The first just like you may know them from IRC chat or Twitch chat (which is IRC as well). 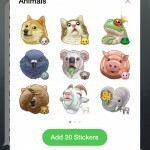 One provided bot allows you to view individual stickers and rate them; allowing you discover new sticker sets which you can add, so you can add to your own sticker set, keeping them handy for whenever you may need them. Another bot can be used to create polls – mostly useful in group conversations. More bots and information in the release blog post. Just yesterday, another great addition: Search and watching linked media without leaving the app.